For a spicy food lover like myself, I was so excited when I saw Jane and Sonia cooked this delicious Vietnamese Spicy Lemongrass Chicken. As I have all the ingredients in my pantry and lemongrass in my backyard, what I need is to buy some chicken meat. This fragrant chicken with chilli and lemongrass is really super easy to cook with less oil being used and it is so helpful if you’re running short on time. Definitely a keeper! 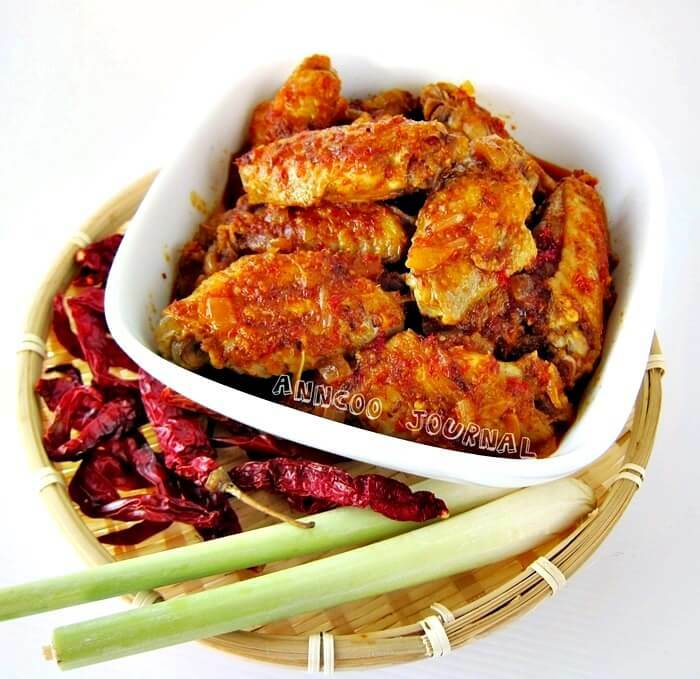 Spicy lemongrass paste - Soak dried chillies in hot water for 20 minutes, rinse and drain. Remove the outer part of lemongrass, clean and slice lemongrass, ground it coarsely together with all other ingredients into paste. Stir fry lemongrass paste with oil till fragrant under low heat. Set aside for later use. Heat up a cooking pan (I used a non stick pan), turn the heat to medium and cook the chicken pieces without oil, cover it if needed, until the grease started to release. (If using skinless chicken/chicken breast, you will need to add 1 tsp of oil or so to grease the pan). When the grease released is visible, stir in the chopped onion and cook for another minute, now add 1 tsp of curry powder, stir well and add 2 tbsp of Spicy Lemongrass Paste, stir for another minute, add about ½ cup water, salt, light soy sauce/fish paste and sugar. (I added another ¼ cup water as I find the sauce is a little salty). Bring sauce to boil and when the liquid reduced to the thickness of your liking, it's done. Ann, thot of cooking this for a gathering….may I ask why need to remove the outer layer of the lemongrass? Is there any difference in taste if I don't use fish sauce and palm sugar? Thanks! Ai Li, the outer layer is dirty and you only need to use the lower part of the lemon grass, about 2 inches long. I'm not sure about the fish sauce and palm sugar as I only used soya sauce and normal sugar. Thanks, Ann! I know what to do now. Appreciate it! Ann, I cooked this the other day and it was great. Yes I had to add more water as it was too salty. My family loves it! Thanks! Thank you Kris. You can grow it in pot too. DesperateHousewife, Thank you visiting 🙂 Yes lemongrass tea is the best! wow – 30 chillies ??? That's a whole LOT of chillies. Any specific type? Sounds yummy and also very hot. I quite like hot – but what sort of volume of chillies in 2tsp ? ….. I can't imagine using 30 chillies in one go. Sarah, hahaa…you're not suppose to use all that lemongrass chilli paste (I am using dried chilli not fresh chilli), that is too much! Just take 2 tablespoon from the lemongrass paste and keep the remaining paste for other cooking…maybe seafood. Lemongrass in your backyard? Wow, I envy. I love lemon grass, i even have them in my tea. This recipe is my to do list. Thank you. You grew lemongrass in your backyard? Wow that is so cool!! Janine, Hope to see yours soon. Thank you Cheah 🙂 Do you like spicy food? Jo, Bee, yes this really good. This looks perfect to me, yummy and such nice color! I need to plant more lemon grass in my backyard. Ohh this is such a good dish with steam rice! Think I should be like you and try out more recipes like this! Yum! I can't blame you for trying out the recipe coz I want to as well! Haha .. it's making me drool already. How not to drool? Your pictures are so well taken, can smell the lemongrass fragrance here! I made this a few weeks ago and I loved it too…! I love spicy food. Ann, you really made me drooling … just by looking on your photos. hi ann, i'm sure this is one dish that going to be loved by many. mouthwatering!! oh dear, i'm geting ready to sleep, hope i wont be dreaming of these lemongrass chicken tonite! haha! Oooh…delicious! I need a big bowl of rice to go with this. The colour looks so pretty. I'm sure it's very fragrant. Ann, you are making me very hungry! 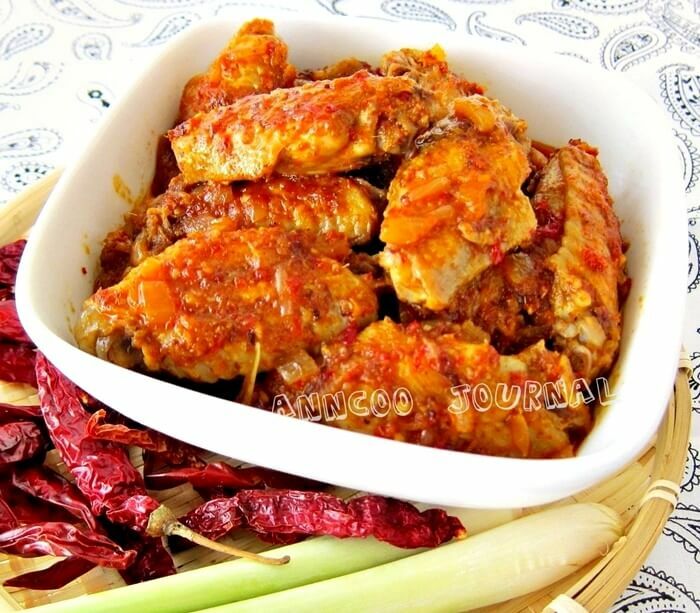 My late mother used to cook this dish before she called "Ayam cooked with Rempah"
Our family love this dish. Love the super spicy paste. Especially now when the weather is so chilly. LeQuan, Thanks! Lemongrass is very easy to grow. Just stuff the bottom of the lemongrass into the pot. Chris, you can blend with 25 dried chilli and add less lemongrass paste when cooking. awww!!! should have checked your blog this morning while I was racking my brains on what to make out of some chicken breasts I had. Oh well maybe next time, looks really delicious!! oh anncoo been looking for your new site for hours lol..
i love this dish so much…cause of the smell and taste. Definitely delicious and simple recipe. It'd be a big hit in my family for the heat and lemongrass fragrance. I love love love spicy food! Looks pretty awesome. Thanks for sharing! Will try it soon! wow how yummy! You have me at lemongrass chicken! Look very spicy to me – is it spicy? Wooo….love the aroma of lemongrass and the combination of spice paste is absolutely delicious for the chicken. This is sure very appetizing! Ooh, this looks delicious, Ann. I love lemongrass and I love spicy, definitely a great combo! You have lemongrass in your backyard? That is so cool! WOW! it look so spicy but i LOVE it! (: (: im drooling looking at it. simply delicious! wow, very tempting.Will try this recipe. Ya, this is a keeper, the taste is between curry and rendang chicken, yummy!